Walter Abbenseth passed away on February 12, 2006, in his sleep at home. He was 79. 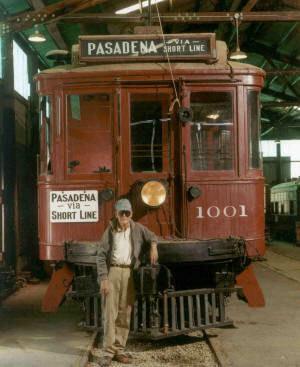 Walter was synonymous with preservation of Pacific Electric trolleys and had joined the Orange Empire Traction Company (later Orange Empire Railroad Museum) in 1956 as member number 99. Walter never married (or drove an automobile either), and except for his mother, had almost no family � at least in the conventional sense. But Walter did have loves in his life: the Angelus Temple and its groups of his close friends, his home, and of course, his trolleys and Museum family. At his memorial service, Walter&apos;s pastor noted that he had missed only five Sunday services since first attending as an infant in 1927, and three of those absences were for work! Walter poses with his "first car", PE 1001 in 2003. Steve Crise photo. Walter spent his entire life in the Los Angeles area, living in Echo Park and South Central LA until 1943, when he moved to Pasadena. He lived in that same house in Pasadena until his death. Walter grew up riding the Red Cars to school, and his fascination with the Pacific Electric caused him to go to work for the company in 1945 at the age of 18. (He had applied two years earlier, but was told he couldn&apos;t be hired until he turned 18!) He started work as a yard clerk at the Butte St. Yard, staying there for 15 years. Following a 1960 layoff, he returned to work in 1963 as an extra towerman at Slauson Tower, remaining there until 1967. He then moved to a succession of jobs at the old PE headquarters building at 6th & Main in Downtown LA. Walter finally retired in the late 1970s, after some 30 years of PE / Southern Pacific service. In 1951 Walter discovered that he was not alone in his interest in Pacific Electric, meeting other local railfans and beginning his participation in the fan trips of the era. He joined the Southern California Electric Railroader&apos;s Association and enjoyed many trips throughout the PE system as passenger operations wound down. Not content with simply taking fan trips and riding the lines on his system pass, in 1953 Walter purchased car 1001, the last of the classic "Tens," which had survived as rail grinder car 00199. Over the years, he shared with many of his friends the disbelief and alarm with which the company greeted the news of an employee buying one of the old cars. Fortunately, Walter was not deterred by their skepticism and the 1001 would become the first of many cars that he helped preserve. 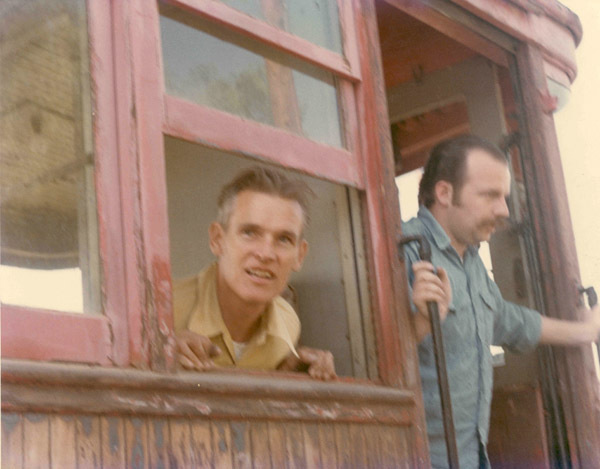 In this 1973 view, Walter is enjoying the very first run of car 1001 at the railway museum- the picture pretty well captures his enthusiasm for all things Pacific Electric. Alan Fishel photo. In all, Walter was intimately involved with the purchase of eight Pacific Electric cars, the 1001, "Hollywood Cars" 637, 716, 717 and 5123, "Blimps" 314 and 418, and of course the famous 1299 Officer&apos;s Car. Without Walter&apos;s intervention, the face of our collection would surely be very different today. Although he always referred to them as "his" cars, it was more of a fatherly instinct than someone describing objects he owned. Thanks to Walter&apos;s efforts, thousands of people have been able to really experience what it was like to ride the "Big Red Cars," instead of just reading about it in books or looking at old photos and films. Because of Walter and others like him, we can still experience the sights and sounds of riding, working, and even operating these magnificent machines. Walter also left behind an amazing collection of PE photographs and memorabilia. In accordance with his living trust, the collection of over 10,000 PE images, as well as many hours of movie film, have been donated to the Museum. As Walter&apos;s health declined in early 2006, the Museum acted to name Carhouse Two in his honor. He knew that this had been decided and was quite proud of it. He unfortunately passed before the ceremony could be held at our March 4 Annual Meeting. The dedication ceremony featured a lineup of Walter&apos;s cars in front of the carhouse, and a sign was unveiled proudly proclaiming "Walter Abbenseth Carhouse." A memorial service will also be held at the Museum on Saturday May 13. Walter would have been 80 years old on the 15th of May. All are invited to attend-come join us for an afternoon of Walter stories and of course rides on some of his favorite cars! Abbenseth Carhouse ceremony c (and b)- several of Walter's many friends spoke at the dedication of the Walter Abbenseth Carhouse on March 4. Several of "Walter's Cars" were lined up in and around the building for the ceremony. A memorial service will be held at OERM on May 13, all are invited. John Smatlak photos. For further reading on Walter Abbenseth&apos;s life, we recommend obtaining a copy of Monograph #7 from the Pacific Electric Railway Historical Society "Walter Abbenseth, Remembrances of the Pacific Electric Volume I.". The monograph was put together by Walter&apos;s life-long friend Jack Finn, who will also be issuing Volume II very shortly. Copies are available through the Museum&apos;s Pinacate Station bookstore. Additional information about OERM&apos;s collection of Pacific Electric equipment can be found at this link.